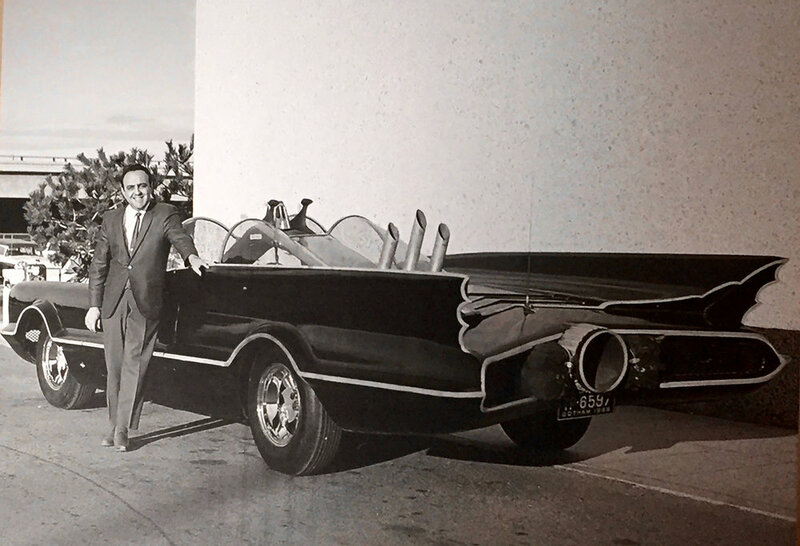 George Barris and the 1966 Batmobile he created from a Lincoln Futura show car. George Barris? Most people, if they've heard the name at all, know him as the creator of a Batmobile for the 1966 Batman television show. Few are aware of his amazing number of movie cars, celebrity customs, show cars, and novelty rides from mild to wild. In a career that spanned six decades, Barris earned his self-created title, King of the Kustomizers. Sam and George started out by customizing an old clunker their parents had given them, realizing their innate talent. After relocating from Chicago to live with their uncle in Sacramento when their mother died, Sam and George Barris grew up in northern California, migrating to Los Angeles during WWII. After the war, they started a small shop to offer customizing services and soon won awards and gained notice. Though the business grew, Sam left in 1957 to relocate to Sacramento. George stayed in the area, moving the shop to North Hollywood where he began to tap into growing movie/television industry’s hunger for custom vehicles. Once they’d relocated to Southern California, their sharp looking personal customs soon led to accepting work from others and they were in business. Sam was a quiet artist/craftsman oriented towards clean, flowing, artistic bodywork. George was a visionary and a genius promoter who made sure their names often appeared in the growing array of new magazines dedicated to the custom car art form. Sam dropped out of the partnership in 1957 to return to Sacramento, leaving George in Los Angeles where he quickly realized the value of working for the entertainment industry. By the mid-20th century California had evolved to become America's incubator of youth trends from hot rodding, to surfing, to innovative rock bands, to hippies. Fads and fashions flourished in the state’s sunny climate to explode through media, sparking the country’s culture, and the world's. Barris was the man on the scene, ready to supply whatever four-wheeled needs that car shows, model kit makers, studios, and stars required. Famed customs created by Barris’ shop during its prime included the Golden Sahara, the Ala Kart, and the Hirohata Mercury. With his growing reputation as customizer to the stars, George Barris was commissioned to customize a pair of Mustangs for Sonny & Cher, a novelty golf cart for Bob Hope, a coffin-styled dragster for the Munsters TV show, The XPAK, an air car that actually levitated, a Raiders' Coach for Paul Revere & the Raiders, a moon buggy that earned praised from NASA, several "America's Most Beautiful Roadster" award winners, a customized Cadillace station wagon for Dean Martin, and show cars for Detroit manufacturers, all the while photographing cars for magazines, consulting with plastic model kit manufacturers, and making personal appearances at car shows nationwide. Legendary chronicler of the American scene Tom Wolfe visited Barris Kustom City in 1963 and, inspired by a car George was working on at the time, titled his collection of essays The Kandy Kolored Tangerine-Flake Streamline Baby. “You have to reach the conclusion that these custom cars are art objects, at least if you use the standards applied in a civilized society,” he noted. Customizing legends including Von Dutch, Dean Jeffries, Bill Hines, and Larry Watson all worked with Barris at one point or another as the shop produced a constant stream of custom creations. In the early 1960s, Barris’ Hollywood association led to his purchase (for $1) of Lincoln’s dramatic 1955 Futura concept car that he placed in “It Started With a Kiss,” a romantic comedy starring Debby Reynolds and Glenn Ford. Later, given just three weeks to produce a Batmobile for Paramount’s 1966 Batman television series, Barris modified the Futura to studio specs, painted it black and created an icon so legendary it eventually sold for over four million dollars at auction in 2013. George Barris stayed active up until the end, working daily at the shop, and producing the annual Culver City Car Show until his quiet passing in 2015, just days before his ninetieth birthday. Disclosure: I wrote a chapter of King of the Kustomizers, the Art of George Barris, published in 2015. At nearly five hundred pages, the exhaustive volume ranks as the definitive look at Barris' output. Copious color photos meet informative text that finally gathers all his mind-boggling output in a single, deluxe volume edited by his son, Brett.